The Albanian Republic, Republika e Shqiperise, is located in southern Europe on the Mediterranean Sea. Montenegro borders Albania in the north east, Kosovo and Macedonia are located on the east and Greece is to the south. Albania borders the Adriatic and Ionic Seas in the west. The country covers 28,748 square meters, 27,398 sq. meters of which are land and 1350 sq. meters are water. The map shows a frontier of 720 kilometers. This little country on the Adriatic coast is often called the Switzerland of the Balkans because of its many mountains. About one third of its surface is covered with woods and more than two-thirds of the state is mountainous, some of it high mountains. Between Shkodralake in the north to Vlora in the south, are very few kilometers of broad wet land along the coast. 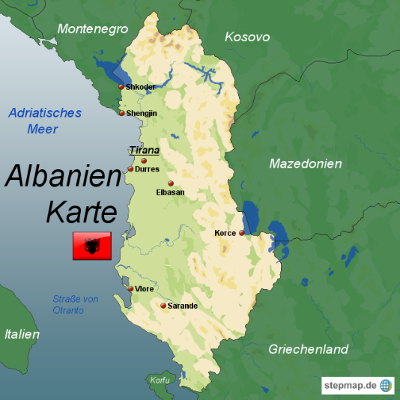 In a country smaller than Belgium, Albania has a population of 3,194,417 inhabitants, just a bit less than the population of Berlin. The majority of the people (99%) are Albanians. There is a Greek minority which is concentrated in the southern part of the country. Another minority are Slavic Macedonians. They live primarily in the eastern border area, along with Romas and Macedo-Aromanians. Albanians are divided into two main groups, the Gegen which lives in northern Albania, and the Tosken which lives in the southern half of the country. In the countryside of the Gegic North archaic structures such as blood revenge still prevail.